This hot sauce is a simple, great sauce to take to a barbeque. While you can mix everything in advance, add the toasted rice at the last minute so that the crunchiness doesn't get soggy. Even soggy on the second day, it still tastes good though. 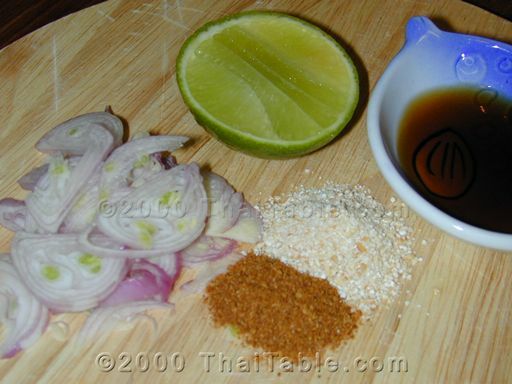 Crush the toasted rice in a mortar and pestle or grind it up with a spice or coffee grinder. Some should be finely ground, but leave some larger pieces. Combine all ingredients and mix well. You should be able to taste the fish sauce, the lime and the nutty flavor of toasted rice.